Third part of the S2S VPN series. Again with Cisco, but this time on an ASA. Since the ASA can be managed in GUI with ASDM, configuration is quite straightforward. 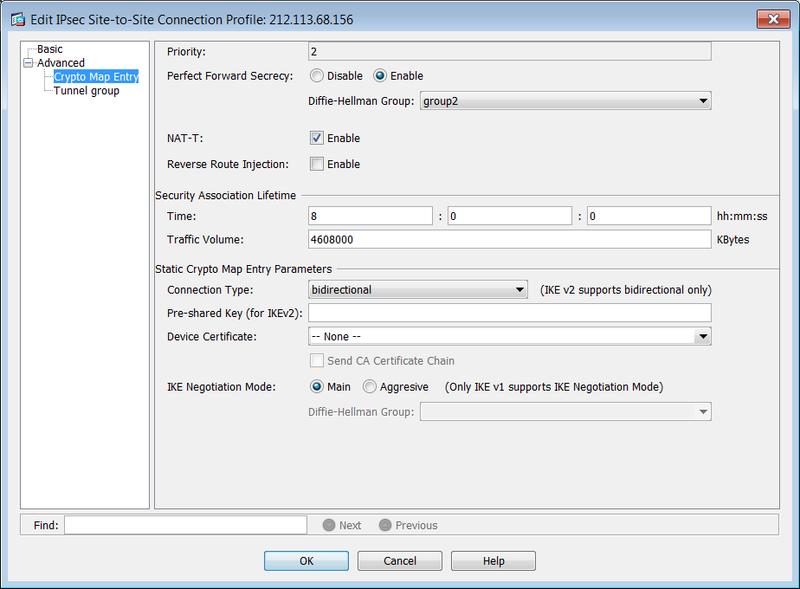 The S2S VPN configuration menu can be found under ‘Configuration’, ‘Site-to-Site VPN’. There you can add a new VPN connection, or edit an existing one. The configuration menu needs little explanation, as it nicely covers everything a S2S VPN needs (see part I). Only worth noting is IKEv2, which isn’t used a lot these days and can safely be disabled. The IKE and IPsec proposals are already filled in with all supported combinations. The VPN will work this way but it can be easier to troubleshoot and understand to just allow the proposals that are needed for a VPN. If you want to use PFS, it can be found under ‘Advanced’, ‘Crypto Map Entry’, together with some more options. Unfortunately, seeing whether a VPN is up or not in the GUI isn’t possible. But the GUI does have logging, which can show the buildup and even reasons for failure in real-time. The CLI, just like with a Cisco IOS, uses the commands ‘show crypto isakmp sa’ for Phase 1 and ‘show crypto ipsec sa’ for Phase 2. Straightforward, isn’t it? Now that the theory has been explained, on to the first S2S VPN configuration. This example will use 3DES and MD5, DH Group 2, and some default lifetimes. The policy number does not have to match with the rest of the upcoming configuration. In fact, the IOS tries to use all Phase 1 proposals configured for all VPN peers until a matching one is found, e.g. if policy 1 matches, then it will be used, if it doesn’t, policy 2 will be tried, and so on. For Phase 2, some more parameters are required. First the ‘transform set’, which is how the packets will actually be encrypted. The name is free to choose. Try to keep it consistent, I usually start the name with ‘VPN-‘ here. The ‘esp’ in ‘esp-3des’ means the use of the Encapsulating Security Payload (ESP) header. The other option, Authentication Header (AH) is rarely, if ever, used. HMAC, or Hash-based message authentication code, specifies the mathematics for the encryption, and it’s the only available option. You can set transport or tunnel mode in the configuration. It defaults to tunnel mode and unless transport mode is needed for a specific reason, it’s the best way. Next the encryption domain. Not surprisingly, IOS uses an extended access-list for this. I like to use naming conventions and best practices. My encryption domain access-lists are usually named ‘AL4-VPN-…’ and use sequence numbers for clarity. Also, it’s perfectly possible to use single hosts in an accesslist (wildcard 0.0.0.0 or ‘host’ keyword), and you can use multiple lines to send multiple subnets through the tunnel. Of course, the remote peer should have the same encryption domain, but his source subnets should be your destination subnets, and vice versa. and a valid access list have been configured. The ‘1’ used above is the sequence number. You can only assign one crypto map name per interface. To have multiple VPNs through the same interface, create crypto maps with the same name, but different sequence numbers. Also, depending on the platform, sometimes a (static) route out of the VPN enabled interface for the remote subnet is needed, although usually a default route will do. Either add the static routes manually, or issue ‘reverse-route static’ under the crypto map configuration, after which the routes will automatically be created. The VPN is now configured but will not come up until it is triggered by ‘interesting traffic’, traffic matching the access list that needs to be encrypted. Troubleshooting is done using ‘show crypto isakmp sa’ for Phase 1 and ‘show crypto ipsec sa’ for Phase 2. These commands and their subcommands give an indication if the VPN is up. That concludes the Cisco IOS VPN configuration. Other platforms will be described in upcoming parts! Site-to-site VPNs part I: theory. The different types of VPN I’ve explained before, but in the upcoming articles I’ll cover more configuration details of site-to-site (S2S) VPN connections on different platforms. To set up a S2S VPN and connect two or more remote subnets to each other, first some theory about the required parameters. I’m not going to cover everything in-depth, just enough to set up the VPN. A VPN uses encryption and hashing: encryption so no outsider can capture useful data, and hashing to verify that the sender the data is who he says he is and no alteration of data was done in transit. First encryption. Important to understand here is that no encryption is truly unbreakable. Any key or encryption can be broken with brute-forcing: just trying all possible combinations until the right one is found. The encryption standards just have a massive amount of combinations, making this nearly impossible, e.g. 128-bit keys yield 3.4*1038 possibilities. 3DES, uses 168-bit keys to encrypt data. It’s been around since 1998 and some weaknesses have been found, but none that bad that encryption can be broken in a reasonable amount of time. AES, which uses 128, 192 or 256-bit keys. One weakness has been found so far, now requiring four times less computational power to break AES, but still well beyond any reasonable time frame (modern-day computers would still need millennia). Blowfish encryption is an open standard, but not widely supported in vendor products so rarely seen in production environments. Most devices do support DES encryption (yes, 3DES is derived from it), but DES is considered breakable and insecure. MD5, while using 128-bit hashes, is considered insecure. A modern-day multi-core computer can break the encryption in less than a minute. SHA. SHA-1 uses a 160-bit hash, but has weaknesses and just like MD5 is supposedly cracked in less than a minute. SHA-2 however uses several different key lengths and has as of this article’s date not yet been broken, which makes it the only safe hash with support on many platforms. SHA-3 is a new standard that was announced just this month, and has no practical implementations yet. While most of these hashing methods by themselves are insecure, they are still widely used in VPNs because the encryption provides sufficient protection already (the hash is also encrypted). Adding to the confusion, some platforms mention ‘SHA’ without indication about the version. While most implementations simply ask the group, some ask for bit-length. Group 2 and 5 are used widely, and generally group 1 is not recommended because it’s suspected to be breakable in a reasonable amount of time with realistic computational power. DH Group 7 is a special one: it’s made for devices with low processing power, like PDAs. I couldn’t find any objective source claiming this encryption is better or worse than group 5, but most seem to agree it’s less secure. Another important parameter is the mode used to connect: main mode or aggressive mode. Cisco also supports quick mode, see their site for a brief explanation. Quick mode is rarely used. And last but not least: the timers. The VPN will renegotiate from time to time. Unlike the previous parameters, if these timers do not match on both ends, the VPN might come up, but will become unstable and disconnect from time to time. Now that all important parameters are listed, one more thing: a VPN connection consists of two phases. Phase 1 is the initial setup of a secure tunnel, using a common encryption, hashing, renegotiation timer and DH group. Inside that secure tunnel, parameters for the actual encrypted tunnel for data are negotiated: again encryption, hashing, a timer and optionally a maximum data limit before renegotiation. This is Phase 2. Also optionally, during Phase 2, you can use ‘Perfect Forwarding Secrecy’ (PFS), which means Diffie-Hellman key exchange will be used again inside the secure tunnel. Note that the parameters (encryption, hashing, timers and optionally DH group) do not have to match between Phase 1 and Phase 2: you can use AES-256 SHA-2, DH group 5 for Phase 1, and a less resource-intensive 3DES MD5 DH group 2 for Phase 2, for example. Obviously, they have to match between the two connecting devices. 1) The Phase 2 also needs to list the traffic to encrypt, usually in a ‘from subnet x to subnet y’ form. Sometimes referred to as ‘encryption domain’. 2) How do the VPN peers actually exchange policy information? Through the exchange of IKE packets on UDP port 500, containing the Phase 1 information. That concludes the theory. In the following articles, I’ll explain how to set up a VPN connection on different platforms. Stay tuned! Different types of VPN explained. Since I’m going to talk more about VPNs in the upcoming weeks, I’m going to explain the different types of VPN here. No configuration guides, but an explanation so it’s clear what is what. Policy-based: interesting traffic triggers an ACL and is encrypted and sent to the remote VPN peer. Routed: traffic is routed into an encrypted tunnel to the remote VPN peer. For a detailed explanation and configuration, Jeremy made some excellent posts about this on Packetlife: Part 1 for policy-based and Part 2 for routed. A dynamic multipoint VPN is not a protocol but more a technique using different protocols. One or more central hub routers are required, but the remote (spoke) routers can have dynamic IPs and more can be added without having to modify the configuration on the hub router(s), or any other spoke routers. The routers use a next-hop resolution protocol, combined with a dynamic routing protocol to discover remote peers and subnets. The VPN itself is a mGRE tunnel (GRE with multiple endpoints) which is encrypted. This way, traffic between spoke routers does not have to go through the hub router but can be sent directly from spoke to spoke. A client VPN is an encrypted connection from one device towards a VPN router. It makes that one remote device appear as a member of a local subnet behind the VPN router. Traffic is tunneled from the device (usually a computer or laptop of a teleworker) towards the VPN router so that user has access to resources inside the company. It requires client software that needs to be installed and configured. This type of VPN works like a client VPN. The difference is that the remote client does not need preconfigured software, but instead the browser acts as VPN software. The browser needs to support active content, which every modern browser supports, either directly or through a plug-in. Traffic is tunneled over SSL (or TLS) to the SSLVPN router. From a networking perspective, traffic is tunneled over layer 4 instead of layer 3. The benefit is that the remote user does not need to configure anything and can simply log in to a web page to start the tunnel. The drawback that you’ll likely need a dedicated device as SSLVPN endpoint because this is not a standard feature.